The batting didn’t make sense. The bowling didn’t make sense. The scoreboards certainly didn’t make sense. The attendance over the weekend to follow made neither sense nor pennies. A bunch of well-liquored Englishmen clambering over the fence for a hit in Edgbaston’s outdoor nets was the highlight of play on Day 4, their innings with a bright orange rubber ball lasting about as long as either of Australia’s efforts before a couple of security guards lethargically broke up the party. In the Test, if not for the application of a second-game wicketkeeper, the match would have been done in two days. Australia fell apart twice in that time. England mostly fell apart once, but managed to not entirely fall apart when it mattered. Preconceptions fell apart. Assumptions perished. Conventional wisdom floundered in Edgbaston’s castle moat. Nothing worked the way it was supposed to – or at least, the moments that did were so out of place they out-weirded the weirdness. The two-day Test result has only occurred 19 times, and four times since 1946 – a relic of the era of uncovered wickets. The most recent of six such results in Ashes matches came in 1921, and Australia was last on the losing end in 1890. An even older record was under threat on the third day: Charles Bannerman’s mark for the highest percentage of runs scored in a team total. Bannerman made 165 of Australia’s 245 in the first ever Test in 1877, and his mark of just over 67 per cent of the team’s runs has stood ever since. At one stage, though, David Warner had 75 of Australia’s first hundred runs, with the rest of his top six colleagues already gone. If he’d stuck around, the new mark might have been his. Oh, but did I mention that he was playing a doughty rearguard innings at a strike rate of 124? He had 77 from 62 balls in the end, while never looking like he was doing anything other than carefully seeing off the bowling while wickets fell at the other end. Australia lost one wicket on the first day at Lord’s. They lost ten in barely a session at Edgbaston. Rain took out 29 overs and there were still 13 wickets that day. Then 14 the next. Somehow England emerged the better for the equation. The chest-puffed victors of the match before were deflated. It was strange in the first innings to see opener Chris Rogers become the eighth wicket to fall, or that after his score of 52 the next best was 16. The scorecard looked like the aftermath of a Jenga tournament. It was strange that five of Australia’s top six made single-figure scores next time they batted, having seen that the venue had provided a perfectly playable pitch. It was strange to see the responsibility fall to Peter Nevill, the new ‘keeper, and Mitchell Starc the No. 9, to become the only players to face 100 balls in the match. It was strange to see England batting with just as much impatience. Adam Lyth carving. Ian Bell clubbing along at a run a ball. Joe Root not far behind. Out trying to force the pace, England careering along. It was strange to see Steven Finn, not just back in a Test team, not just smiling, not just staying clear of the non-striker’s stumps, but bowling on the spot and taking a rush of wickets. Or Nathan Lyon, bowling on a seamer’s pitch that the seamers couldn’t use, in one-over spells that got a batsman every time. He had figures at one stage of three overs, three wickets for three runs. Australia were kept in it by Lyon and by Adam Voges’s jumper, which took the first two catches when England batted. Clutching a slips catch to your body while falling backwards is one thing, snaring a full-power pull shot at short leg with your clothing is another. 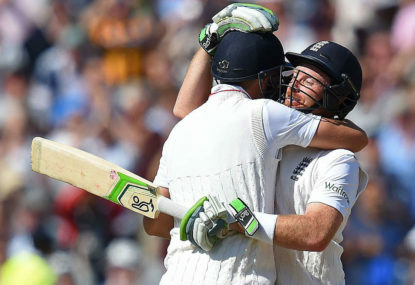 England were kept in it by Moeen Ali, the counter that began with their lead only worth about 60. Mark Nicholas compares him to David Gower, the way his wrists whip in the cover drive. But mostly they were stranger shots, cross-batted slaps and lifts, attacking the bounce and pace he’s supposed to fear. It worked. Just as strange while being not strange at all was the sight of Stuart Broad at the other end, putting aside his bunny days to support Moeen through another 80 runs. He has frustrated Australia out of Test wins before. All that after the start of Day 2, when back came Johnson with two of the best balls he can possibly bowl. I can’t say the best he’s ever bowled, because he’s bowled the same ball so many times. The leaper, the kicker, the one that snorts from the pitch right up the nose of the batsman, giving nowhere to go but an attempted jump and fend to a set of catching hands. All of it happened in front of our eyes, and none of it made any sense. Not the scoring rates, not the kamikaze batting, not the bowling weirdness. Nothing. In a series that hasn’t made sense, this was the new highpoint. Equally stunned were the weekend fans, wondering where their plans had gone, and the staff looking at two days off. Warwickshire County Cricket Club won’t worry – they wisely took out insurance against the game finishing early.